You can now find out about one of our most interesting objects in the archive on our eLearning hub. 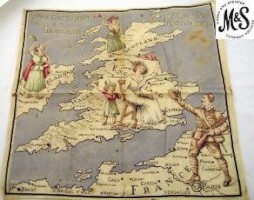 In partnership with My Learning we have created a new resource that explores this First World War handkerchief found in the M&S Company Archive collection. Our eLearning hub is a treasure trove of resources including images, documents and films for you to download and use in the classroom. Pupils can do their own research using our documents, timelines and suggested links or test their knowledge with our interactive online games. From local history to design, to business and enterprise and now the First World War, each theme comes complete with activity ideas and teacher's notes.